General surface preparations for all clear water-repellent applications require that the substrate be clean and dry. (Siloxane applications can be applied to slightly damp surfaces, but it is advisable to try a test application.) 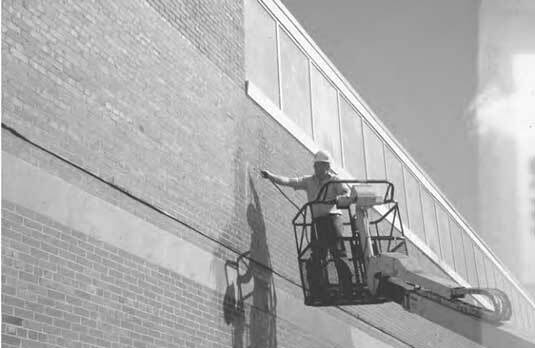 All release agents, oil, tar, and asphalt stains, as well as efflorescence, mildew, salt spray, and other surface contaminants, must be removed. Application over wet substrates will cause either substrate discoloring, usually a white film formation, or water-repellent failure. When in doubt of moisture content in a substrate, do a moisture test using a moisture meter or a mat test using visquene taped to a wall, to check for condensation. Note that some silicone-based systems, such as silanes, must have moisture present, usually in the form of humidity, to complete the chemical reaction. Substrate cracks are repaired before sealer application. Small cracks are filled with nonshrink grout or a sand–cement mixture. Large cracks or structural cracking should be epoxy-injected. If a crack is expected to continue to move, it should be sawn out to a min- imum width of 1 4 in and sealed with a compatible sealant. Note that joint sealers should be installed first, as repellents contaminate joints, causing sealant-bonding failure. Concrete surfaces, including large crack patching, should be cured a minimum of 28 days before sealer application. All adjacent substrates not being treated, including window frames, glass, and shrubberies, should be protected from overspray. Natural stone surfaces, such as limestone, are susceptible to staining by many clear sealers. Special formulations are available from manufacturers for these substrates. If any questions exist regarding an acceptable substrate for application, a test area should first be completed. All sealers should be used directly from purchased containers. Sealers should never be thinned, diluted, or altered. Most sealers are recommended for application by low-pressure spray (20 lb/in2), using a Hudson or garden-type sprayer. Brushes or rollers are also acceptable, but they reduce coverage rates. High-pressure spraying should be used only if approved by the manufacturer. Applicators should be required to wear protective clothing and proper respirators, usually the cartridge type. Important cautionary measures should be followed in any occupied structure. Due to the solvents used in most clear sealers, application areas must be well ventilated. All intake ventilation areas must be protected or shut off, to prevent the contamination of interior areas from sealer fumes. Otherwise, evacuation by building occupants is necessary. Most manufacturers require a flood coating of material, with coverage rates dependent upon the substrate porosity. Materials should be applied from the bottom of a building, working upward (Fig. 3.6). Sealers are applied to produce a rundown or saturation of about 6 in of material below the application point for sufficient application. If a second coat is required, it should be applied in the same manner. Coverage rates for second coats increase, as fewer materials will be required to saturate a substrate surface. FIGURE 3.6 Spray application of clear repellent. Testing should be completed to ensure that saturation of surfaces will not cause darkening or add sheen to substrate finishes. Dense concrete finishes may absorb insufficient repellent if they contain admixtures such as integral waterproofing or form-release agents. In these situations, acid etching or pressure cleaning is necessary to allow sufficient sealer absorption. Approximate coverage rates of sealers over various substrates are summarized in Table 3.11. Priming is not required with any type of clear sealer. However, some manufacturers recommend that two saturation coats be applied instead of one coat. Some systems may require a mist coat to break surface tension before application of the saturation coat.